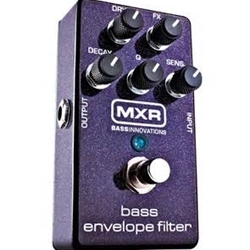 The MXR M82 Bass Envelope Filter adds great sounds for the expert bass player.. The MXR M82 Bass Envelope Filter delivers classic, analog, envelope filter sounds in an easy-to-use and compact pedal designed specifically for bass. Separate Dry and Effect controls let you dial in the perfect mix of effected and direct signals, so you can bring the funk without losing the low end. The envelope pedal's wide range of filter tones can be shaped with the Decay and Q controls, and a simple twist of the Sensitivity knob can tailor the effect pedal for your attack-as well as adjust for passive or active basses. The MXR M82 bass envelope pedal's power supply circuitry is designed to withstand over-voltage or polarity mishaps, and its true-bypass switching preserves your tone in bypass mode. It's all packaged in a durable, lightweight aluminum housing for the ultimate in portability and pedal board space-saving dimensions.